From time to time you may find yourself attempting to remove an oily substance from a very delicate upholstered fabric. Aggressive chemicals can leave you feeling apprehensive about rubbing the stain too hard or disrupting the fabrics appearance using an inadequate brush. A safe and effective procedure is to rub the area with a dry chemical sponge or (soot sponge). You may find complete success. For instance, this works especially well on soil removal from an upholstered headboard on a bed. This sponge is a "special" dry chemically impregnated sponge which scoops up and absorbs dirt and soot into it's pores. 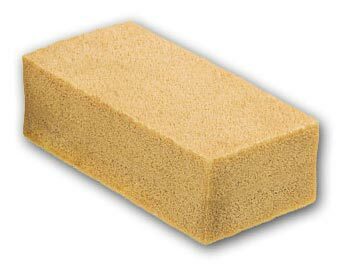 A chemically treated dry sponge is a synthetic sponge sold into the fire/restoration industry. This type of chemically treated sponge is effective at removing soot off of walls, ceilings and other objects prior to the cleaning process.